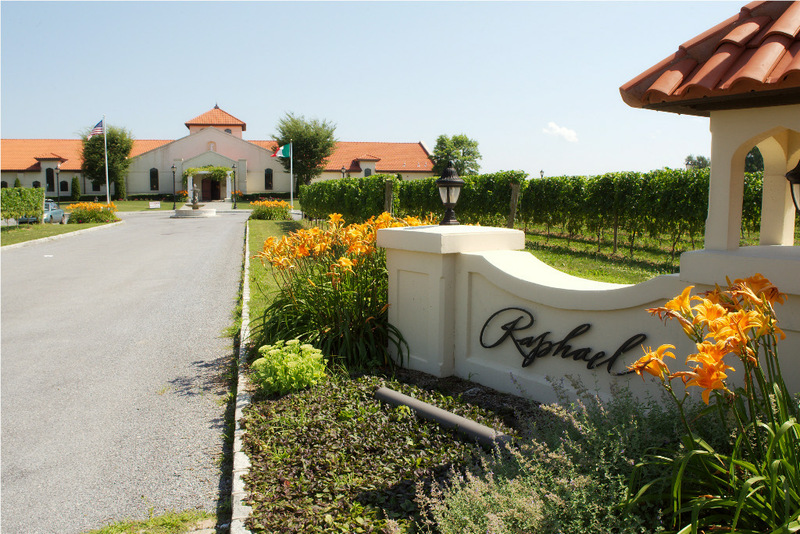 Raphael Winery, in Peconic, on the North Fork of Long Island, was founded by John Petrocelli Sr. and his wife, Joan, and is family-owned. Petrocelli is also the owner of J. Petrocelli Construction, which specializes in quality design and building, and the handsome, 28,000 sq. ft. winery was designed by him, inspired by the architecture of the Neapolitan monasteries of his native Italy. He named it after his father, Raphael, who was an avid home winemaker like his own father before him, so John Sr. came by his oenophilia perhaps genetically. The venture was five years in planning and cost $6,000,000 to complete, with the intention of making the premium winery of Long Island, Italian-inspired but Bordeaux-oriented. In 1996 the Mudds planted the first vineyard for Raphael with Merlot, and have been managing the vineyard, which has grown to 60 acres over the years, ever since, using sustainable practices, including what Steve Mudd calls “fussy viticulture”—green harvesting by hand—from the very beginning. (In fact, the first wine made under the Raphael label came from Merlot vines grown at the Mudds’ own vineyard and were vinified at Pellegrini Vineyard. The first wine produced at the new facility was the 1999 vintage.) Other varieties have been planted since the Merlot, including Sauvignon Blanc, Semillon, Riesling, Cabernet Franc, and Cabernet Sauvignon. According to Steve Mudd, a nine-foot space between rows is supposed to provide room for equipment to move along the rows, but it’s a myth that that much space is necessary. Pontallier, when asked his opinion about the row spacing and vine density, said, “it is not for me to say” what it should be, but back in 1994, when the vineyard was still in the planning stage, he had argued against close spacing, suggesting 3 meters (10 feet). The density of the first planting at Raphael is just 820 vines per acre (9’x6’ spacing) as opposed to about 2,550 in Bordeaux. Later plantings increased the density somewhat, and the rest of the vineyard is now spaced at 9’x5’, or 968 vines/acre. The quality wines produced by Raphael simply would not be possible if it weren’t for the work done in the vineyard by Steve Mudd and his crew. High-quality fruit is always there for the winemaker, even in a bad-harvest year like 2011. For further insight into the viticultural practices at Raphael, the reader is referred to another post, on Mudd VMC, the contracted vineyard manager for the winery. Richard Olsen-Harbich, who had been Raphael’s winemaker since its founding and helped define its style of wines—made reductively, using native yeasts, with minimal intervention, in order to allow the hand-picked grapes to more clearly express the terroir. After he left in 2010 to work at Bedell Cellars Leslie Howard became winemaker, but in 2012 Les moved on and Anthony Nappa, former winemaker at Shinn Estate, maker of Anthony Nappa Wines, and founder of the Winemaker’s Studio, took over as winemaker at Raphael. I met Anthony several years ago, when he was winemaker at Shinn (2007 to 2011). When he first went to there it was with the understanding that he could use their facilities to make wine for his own label, which bears his name. His first wine under his label was 200 cases of LI Pinot Noir. After he left Shinn he focused more on his own wines and made them at Premium Wine Group, the custom crush facility in Mattituck. He replied that by “having standards, the first goal is to just figure out where we are and what’s going on with sales and production, and try to get the business side of things in line as far as what we’re making, cutting packaging costs, and streamlining the whole production side. Raphael wants to make money, so obviously the financial side of it is important. And then on the winemaking side, it was just looking at every product. The first thing is to only make as much as we sell. A lot of wineries just bring in the fruit, make it, bottle it, warehouse it. Our goal is to figure out what we’re selling, and any excess we sell off in bulk—any fruit or wine or whatever—and then figuring out each product and having a standard for it. “We have a whole line of what we call ‘First Label.’ It’s all the Reserve wines, and those are all from our vineyard. We buy a lot of fruit too, but those are all from our vineyard. It’s just like with my own wines, we have very high standards for fruit and we have very high standards for the quality of each wine. I’ll just not make a wine. If the quality is not there, if the fruit doesn’t deliver, it gets downgraded to a lower level wine, and if the vineyard doesn’t deliver, we just don’t buy the fruit. That’s easy for me, because I’m the one buying the fruit. The 2010 First Label Chardonnay ($39), which came out of Mudd Vineyards (there is no Chardonnay planted at Raphael) was pressed to yield 120 gallons per ton of grapes (clone CY3779), so out of 5 tons of this particular parcel 600 gallons, or about 3,000 bottles, were made. It underwent a 100% malolactic fermentation, was kept on its lees, and spent eight months in oak barrels. It was bottled unfiltered, with low sulfites. The result was that in the glass the wine was clear, offering citrus, butterscotch flavors, and toasty notes. It has the typicity of an oaked Chardonnay, somewhere between a Burgundy or California version. 2010 was perhaps the greatest wine vintage in Long Island—given its early budding, excellent weather, and early harvest—and the quality of the Chardonnay was also a reflection of this. Made by Leslie Howard. The 2013 First Label Sauvignon Blanc ($28) The last months of the growing season had no precipitation and no notable disease pressure, so Raphael was able to harvest each grape variety at leisure and at each one’s peak. According to them all the wines from 2013 show exceptional natural balance and full ripeness, which is also promising for the future longevity of the wines of this vintage. The Sauvignon Blanc was made from hand-selected grapes from their oldest vines to help produce balanced, structured wines. Made with partial skin contact and cold-fermented in stainless steel, this dry wine exhibits a bright nose of citrus and pineapple, along with flavors of pineapple, grapefruit and lemongrass, a full body and a long dry acidic finish.It’s a clear, pale-lemon colored wine with aromas of pineapple, white peach, and, citrus; clean, medium-bodied, with high acidity and a mineral finish. An exceptionally enjoyable Sauvignon Blanc that matches well with seafood and spicy Indian and other Asian cuisines. Made by Anthony Nappa. 13.1% ABV. The 2013 First Label Riesling ($28) from the same excellent vintage as that of the Sauvignon Blanc described above. The grapes were hand-harvested and pressed very gently after two days of skin contact in the tank. The juice was fermented using naturally-occurring indigenous yeasts from the skins. Fermentation was carried out cold at 55F and lasted 5 weeks. The wine saw no wood, as befits a Riesling. It was blended from several batches and then bentonite-fined for heat stability, cold-stabilized and sterile-filtered before bottling. 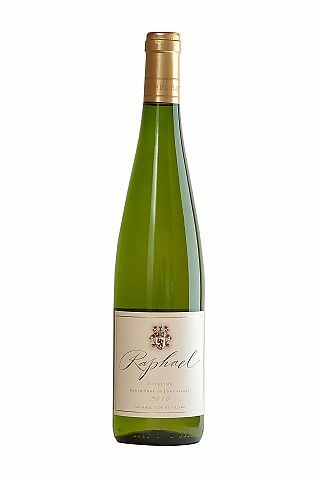 This is a limited-production, dry Riesling that offers a firm but balanced acidity matched by fruit concentration that produces a beguilingly aromatic and rather full-bodied—for a Riesling—with a dry, minerally finish. This wine shows flavors of fresh apricot and ripe pear. Excellent as an aperitif or to accompany seafood, chicken dishes, and spicy cuisines. Anthony Nappa. 12.4% ABV. The 2013 Cabernet Franc ($25) also benefited from the excellent conditions of the vintage. The fruit was hand-harvested, de-stemmed, and crushed. The grapes from different lots were then fermented apart. The fermentation was carried out at 75F to retain fruit flavors and took a month with pumpovers twice a day. The wine was aged with 50% in stainless steel and the rest in French oak barrels, where it underwent natural malolactic fermentation. The aging took ten months before the wine was blended and then bottled unfiltered and unfined. The resulting wine has a firm acidity, full body, and offers a pronounced fruity aroma of ripe red berries with herbal notes and a hint of tobacco. It is actually ready to drink now bout would certainly bear aging a few more years, given that it was so recently bottled. A fine accompaniment to any variety of pork, beef, or lanb dishes. It would be good with cheese or chocolate as well. Anthony Nappa. 12.9% ABV. 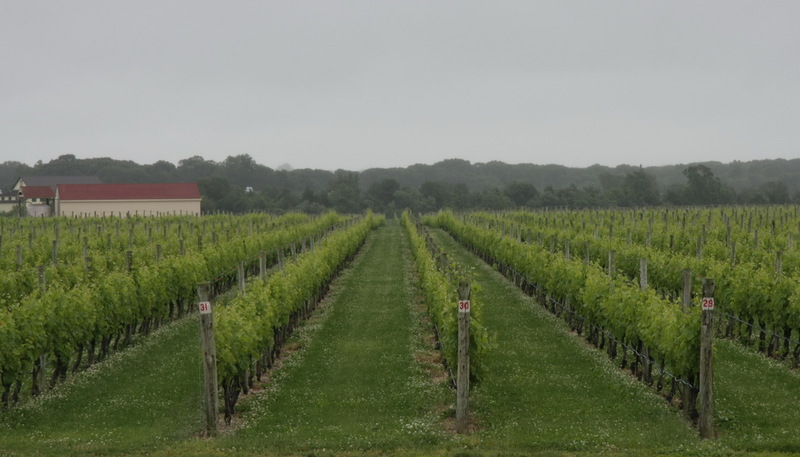 In June 2015 the Wine Advocate blog posted a review of 200 Long Island Wines, of which 7 were from Raphael, earning scores of 86 to 92 points. The top Raphael wine was the 2010 Merlot First Label, by Leslie Howard, with 92 points, followed by the 2014 Suvignon Blanc First Label, at 91 points, by Anthony Nappa, and the 2010 Cabernet Sauvignon by Howard at 90 points. Quite a track record from Robert Parker’s Website. 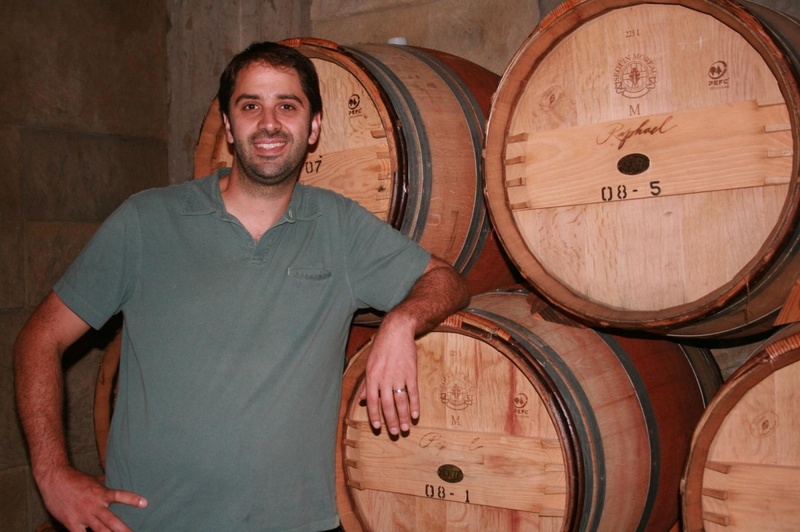 For further reading, Anthony Nappa and his own brand of wines were written about by Eileen Duffy in her book, Behind the Bottle (Cider Mill Press, 2015). This entry was posted in Vineyards, Vinification, Viticulture, Wineries and tagged Anthony Nappa, David Mudd, First Label, Joe Vergari, John Petrocelli, Leslie Howard, Long Island Wineries, Mudd Vineyard, Mudd VMC, North Fork AVA, Paul Pontallier, Peconic, Raphael Winery, Richard Olsen-Harbich, Richard Smart, Sarah Evan Nappa, Steve Mudd on 24 November 2014 by JoseM-L.